For those you made it to Praxis6 and those who could not, I thought of sharing a blog piece on my experience from the majestic Jaipur where this year’s largest Public Relations congregation was held. Let me start by introducing myself. I am Megha, a PR professional, with nearly 5 years of experience in the field. Currently, I am working with Hill + Knowlton Strategies, as Account Manager in the Client Servicing Team. Prior to joining H+K Strategies, I have worked in the Marketing Communications and PR teams at LeEco and Perfect Relations. Although there are many well-known platforms for PR professionals wherein they share their knowledge and insights from the world of PR, however there is one which needs a special mention. 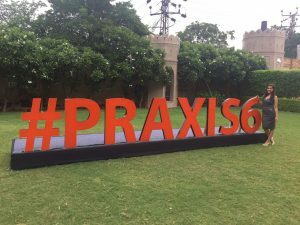 Praxis – is an annual conference of Public Relations and Corporate Communications professionals, which recently held its 6th edition in Jaipur city. Like every year, Hill + Knowlton Strategies, was a sponsor and sent a team to attend the same. I was one amongst the group who got a chance to attend this 2-day long PR Summit. I was thrilled at this opportunity, since I was keenly waiting to be a part of such a prestigious platform that would help me develop a more in-depth understanding of the PR industry. Both the days started off with us attending various sessions by multiple International and Indian communications professionals on diverse topics, like the growing power of New Age Media, Augmented Reality, Integrated Communications etc. There were panel discussions on various interesting topics that kept us glued to our seats. While the sessions were enlightening, this platform also gave me a chance to network with some like-minded people, who have a passionate dispensation for the field of Public Relations and Communications. One of the most inspiring topics that grabbed my attention at the summit was titled ‘Using the Power of Communications to take Healthcare Closer to Patients’. The talk explained in detail how in the Healthcare industry, creating awareness about various diseases is more critical than selling the products. Being a vast yet diverse sector, it gives communications specialists the opportunity to wear their creative hats in order to make the messaging simple, relatable and something that can resonate well with the target audiences. The session offered insights into how technological advancements have aided the process of healthcare knowhow and so in line with these developments, the communication industry must align itself to these changes. The conference was a moment of pride for H+K Strategies as our COO, Ms. Deepa Jayaraman was one of the esteemed speakers for a panel discussion. With more than a decade-long agency experience, she gave her valuable insights in the functioning of this industry. She spoke at length about the opportunities and challenges of working in a consultancy and the plethora of learnings on a daily basis. I thoroughly enjoyed this session, as I was able to relate to her experiences. These thought-provoking sessions were followed by an enjoyable cocktail night that offered an element of relaxation to all the participants. The Raghu Dixit concert on the evening of day 1 and the Jam session by DJ Angel on day 2, kept us entertained and excited. Alongside these, I got a chance to interact with some of my old colleagues and also make some new friends, budding and stalwart communications professionals. Lastly, as the famous saying goes ‘It’s not about the destination, it’s all about the journey to get there’, I got a chance to interact with my office colleagues while on our way to Jaipur. I got to witness a different side of them, one which is fun and adventurous. This experience helped us in breaking free from the office monotony and develop better interpersonal connections. All in all, the #PRAXIS6 was an important milestone in my career graph and I hope to be speaking there one day!